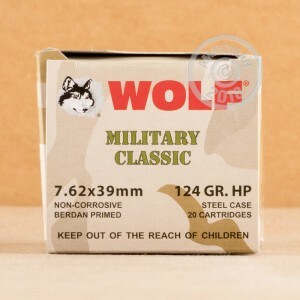 These 7.62x39mm cartridges from Wolf are just what the SKS and AK series of rifles were designed to use. Each cartridge in this box of 20 fires a 124 grain bimetal jacketed hollow point bullet suitable for both range and hunting use. At close range, this round can help you put venison on the table for cheap! This ammunition, like most Russian-made ammo, uses non-corrosive Berdan primers and non-reloadable steel cases. 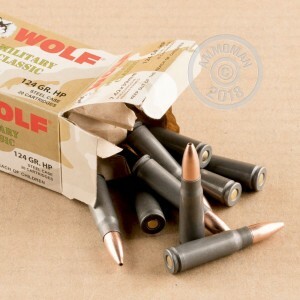 Not all ranges allow steel cased ammo due to its magnetic properties, so check before ordering! Buying ammo doesn't have to be a hassle or a rip-off. Simply place an order for $99 or more at AmmoMan.com and enjoy reasonable prices and free shipping!